Is Monetary Policy Capable of Offsetting Fiscal Austerity? We rarely get to see a major, nationwide economic experiment at work, but so far 2013 has been one of those experiments — specifically, an experiment to try and do exactly what Beckworth and Ponnuru proposed. If you look at macroeconomic policy since last fall, there have been two big moves. The Federal Reserve has committed to much bolder action in adopting the Evans Rule and QE3. 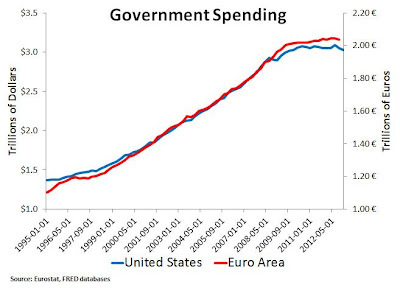 At the same time, the country has entered a period of fiscal austerity. Was the Fed action enough to offset the contraction? It’s still very early, and economists will probably debate this for a generation, but, especially after the stagnating GDP report yesterday, it looks as though fiscal policy is the winner. So Mike Konczal’s assessment of this experiment is that monetary policy has not been able to offset fiscal austerity. Paul Krugman agrees as do other observers who question the effectiveness of monetary policy in a liquidity trap. I agree that there is an interesting experiment going on, but Konczal and Krugman (K&K) oversell what it means and ignore other recent developments that shed light on the efficacy of monetary policy. 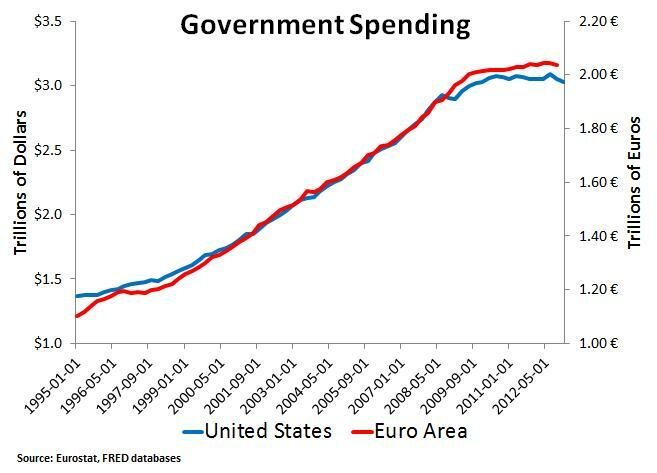 For starters, this experiment is only measuring whether QE3 is powerful enough to offset fiscal austerity. It is not measuring whether the actual proposal Ramesh and I laid out in 2011, a nominal GDP level target (NGDPLT), is capable of offsetting fiscal austerity. QE3 is a big change in Fed policy, but it is still far from a NGDPLT in terms of efficacy. One way to see this is to note that QE3 constrains asset purchases to a fixed dollar amount of $85 billion per month no matter how fast or slow the economy is converging to the Fed’s inflation and unemployment targets. Consequently, if a spate of bad economic shocks–more Eurozone uncertainty, sequestration, China slowdown concerns, etc.–suddenly increased money demand the $85 billion injection may not be enough to offset it. In this case, aggregate demand would slow down and stall the convergence to the Fed’s target. QE3, then, is like taking a road trip and applying the same pressure to the gas pedal regardless of whether one is driving up a hill, down a hill, or on a flat terrain. The trip’s length would depend on the changing terrain of the road (the shocks) and would be hard to know ahead of time even though you know your trip’s destination (the target). This is better than taking a QE2 road trip, where you don’t know your destination, but there is still much uncertainty about how long the QE3 trip will take. Now imagine you turn on cruise control at 70 MPH so that your car automatically adjusts the amount of gas based on the terrain. There would be much more certainty about the trip and much better expectations management. This would be much closer to a NGDPLT and provide the real test of whether monetary policy can offset fiscal austerity. It could be operationalized by conditionalizing the size of the QE3 asset purchases each month so that constant progress to the Fed’s targets were being maintained. QE3, therefore, is farm from ideal and, as Matt O’Brienobserves, it is not even clear the Fed is fully on board with it. With that said, one can still learn a lot about the potential of monetary policy to offset fiscal austerity by looking at the fiscal consolidation in the United States over the past few years. 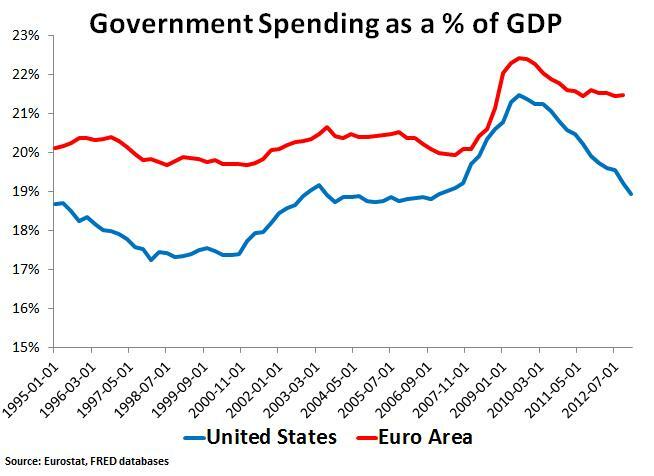 As I have noted before, fiscal austerity has been happening in the U.S. economy since about mid-2010. And yet, the Fed has kept NGDP growing on a remarkablysteady growth path (albeit, below its pre-crisis trend path). This performance is even more remarkable when you consider that there have been other negative AD shocks buffeting the U.S. economy. K&K ignore this achievement and its implications for monetary policy offsetting fiscal austerity. If we now look at government spending as a percent of NGDP, we see that government spending’s share has been falling in both regions. The U.S. decline has been the sharpest. The U.S. series shows a stable NGDP growth rate of about 4%, consistent with the NGDP level figure linked to above. 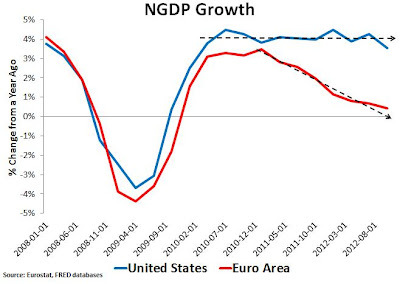 The Eurozone NGDP, however, shows a pronounced decline starting in 2010. So both regions have fiscal austerity, but only the United States has stable aggregate demand growth. The easiest explanation for the difference is monetary policies: the Fed has been far more aggressive than the ECB in responding to the slump. Yes, this is not definitive evidence, but it certainly is suggestive that monetary policy makes a big difference in offsetting fiscal austerity. P.S. Scott Sumner, Ryan Avent, Marcus Nunes, and Matt Yglesias reply as well. 2 Responses to "Is Monetary Policy Capable of Offsetting Fiscal Austerity?" 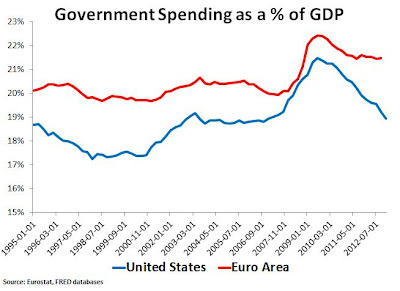 Human nature and politics……….the two most important reasons why monetary policy will never defeat fiscal austerity. When govt and politicians attempt to keep the citizens and voters happy, they soon see a snowball rolling down the hill. Human nature keeps the citizens demanding more and more. And politicians soliciting votes, promise more and more, rising the expectations even higher. These actions will continue until one or more groups of citizens become disenchanted, and start rebelling, usually in the form of civil unrest and property destruction. How far down this road are we? Who knows, but it may be sooner than we all think.